The irresistible smell of a ham roasting in the oven is sure to bring back happy holiday memories. Whether you’re making it for Easter, Christmas, or Sunday dinner, ham is one of the easiest and most popular special occasion meals. 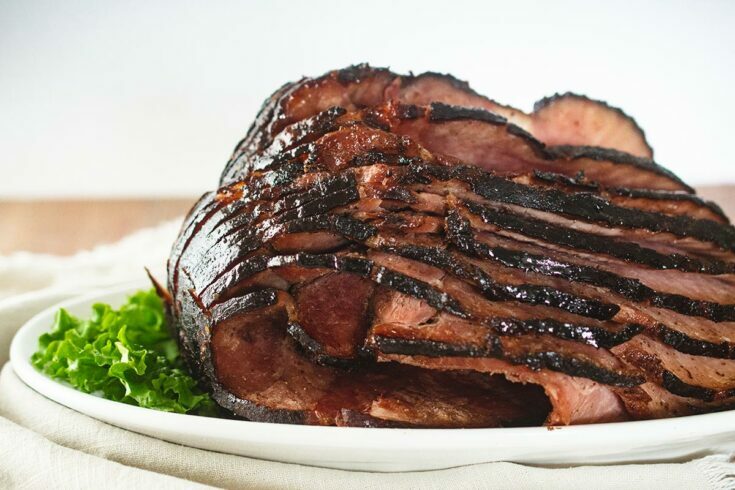 My favorite ham recipe for special occasions is maple glazed ham in an electric roaster oven. The maple glaze adds just enough sweetness to bring out the ham’s savory, smoky flavor. I love to use my electric roaster for holiday meals, because it’s essentially an extra oven. By cooking my maple glazed ham in an electric roaster oven, I can reserve space in my main oven for other holiday favorites, like potatoes, rolls, cakes, pies, or roasted vegetables. If you’re not familiar with what exactly an electric roaster is, it’s basically a smaller version of a regular oven, powered by electricity. I always think of it as a cross between a Crock-Pot and a toaster oven. 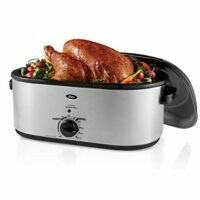 The main reason people would buy an electric roaster oven is to roast a Thanksgiving turkey, but it is useful any time you need extra oven space. 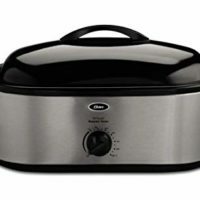 I recommend the 18-Quart Oster Roaster Oven with Self-Basting Lid, which can cook a turkey up to 18 pounds. This is an updated version of the roaster I own. If you want more capacity, I would recommend the Oster 22-Quart Roaster Oven. Honestly, the 18-quart is huge, so I’m not sure I would want something bigger. An electric roaster pretty big and can take up kitchen space – I keep mine in the original cardboard box in the basement when I’m not using it. Choose a bone-in, spiral sliced ham. These hams are easy to serve and look beautiful on a platter. If you are trying to figure out what size ham to buy, a good guideline is 1/3 to 1/2 pound of ham per person. Sometimes spiral sliced ham will come with a glaze packet. 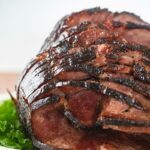 For this recipe, you will be making your own ham glaze, but instead of throwing away the glaze packet, you can just add it to your homemade glaze. A probe-style food thermometer really helps when cooking a large piece of meat like maple glazed ham. I have a Taylor Precision Products Digital Cooking Thermometer with Probe and Timer, and it works perfectly. 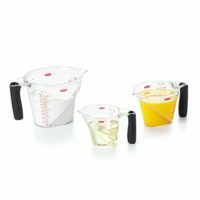 If you want the most accurate, top-of-the-line probe thermometer, I also recommend the ThermoWorks ChefAlarm, rated #1 by Cook’s Illustrated. 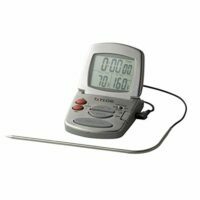 With a probe thermometer, you can insert the probe into your ham or other meat, and set the alarm to go off when it reaches a desired temperature. You won’t have to lift the roaster lid or unwrap the ham to check the temperature, so the ham stays nice and juicy. 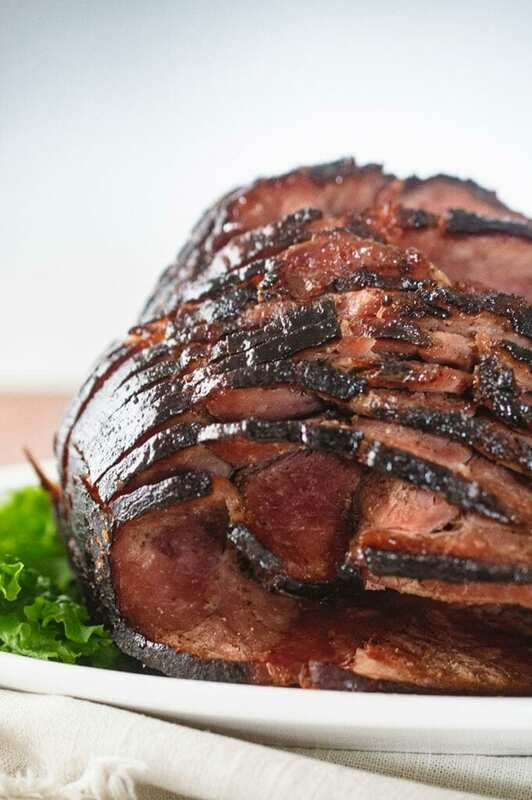 You should heat a fully cooked ham to 140 degrees F.
The key when cooking maple glazed ham in an electric roaster is to heat the ham all the way through and avoid drying it out. 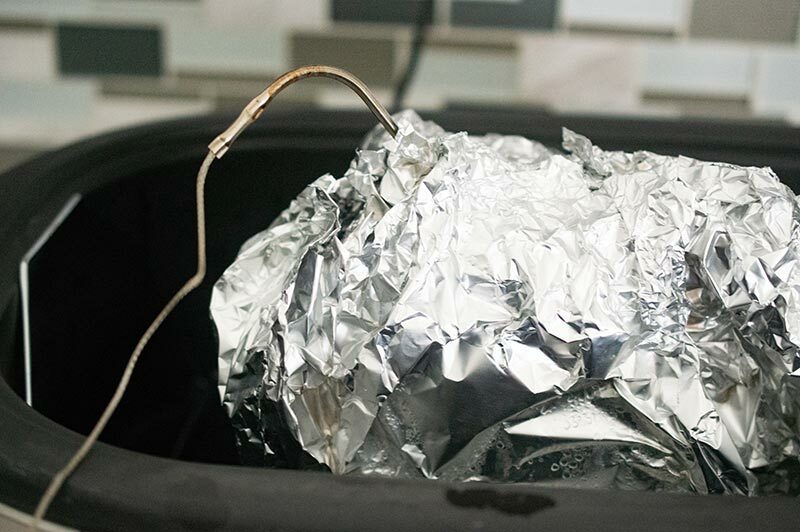 This is done by tightly wrapping the ham in foil, heating gently in a moist environment, and using a food thermometer to check the ham’s internal temperature. The maple glaze is applied when the ham is 3/4 of the way done, then again when the ham is almost done. Optionally, you can turn up the heat and uncover the ham during the last few minutes of cooking to caramelize the maple glaze. Start by pouring 2-4 cups of water in the bottom of the electric roaster. Use enough water to cover the bottom of the roaster to a depth of about 1/4 inch. Place the roasting rack inside. 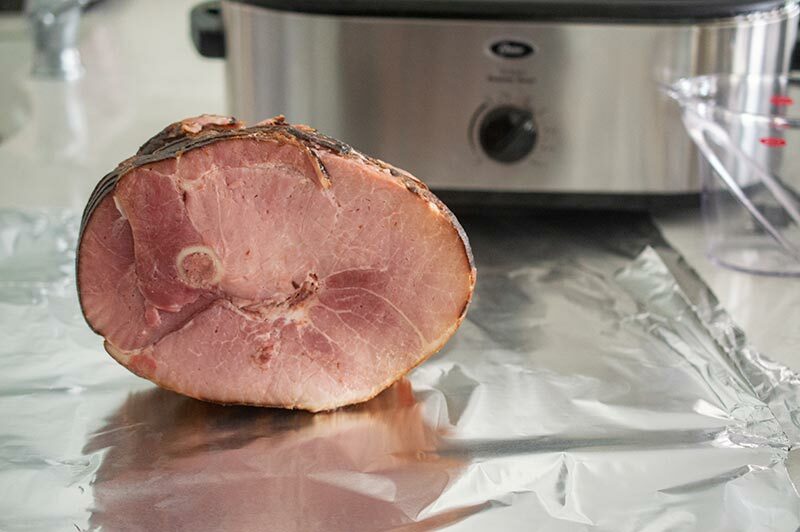 Lay down a few sheets of aluminum foil on a countertop or work surface, overlapping so the juices from the ham will not leak out in between the sheets of foil. Use heavy duty foil. You want enough foil to completely cover the ham. If you have regular size foil, you will probably need 3 sheets. If you have jumbo oversized foil, 2 sheets will be plenty. Carefully take the ham out of its packaging. If there are accumulated juices inside the packaging, try to save those to pour back onto the ham before roasting. Place the ham on its side, so the cut side is facing you. This is important so when you pour on the glaze, some of the glaze will go between the ham slices. Lift the foil and wrap it around the ham, leaving the top open. Place the ham in the roaster on the roasting rack. Insert the thermometer probe in the center of the ham. Try not to touch the bone with the probe. Pour the juice from the packaging, if you have any, over the ham. Secure the foil so the ham is wrapped tightly, but leave it loose enough so you can open it later to pour on the glaze. Put the lid on the roaster, making sure it’s secure. The wire for a probe thermometer is thin and flexible, so you will still be able to close the lid. 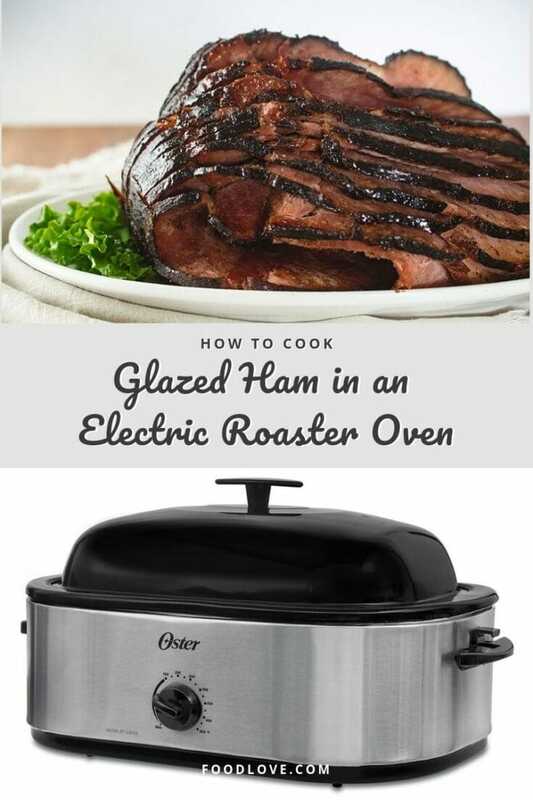 Turn on your electric roaster to 275 degrees F. Set the thermometer to alert you when the ham reaches 140 degrees F. At 275 degrees, the ham will take 15-20 minutes per pound to heat through. My ham weighed eight pounds, so heating it took a little more than 2 hours. Try to time your cooking so the ham gets done about half an hour before you want to serve it. If you have to keep the ham warm for up to two hours, that’s fine, but it will tend to dry out. In a small saucepan, whisk together the maple syrup, brown sugar, apple juice, Dijon mustard, and allspice (recipe below). If you don’t want to use allspice, you can use cinnamon or dried ginger. Allspice is one of my favorite ingredients, so I use it every chance I get! Optionally, if you want to use the glaze packet that came with your spiral ham, add the ingredients for the glaze packet to your homemade glaze. Usually, those ingredients will be the glaze packet and some water. Over medium-high heat, bring the glaze mixture to a boil. Boil the glaze mixture for two minutes, being careful not to let it boil over. This recipe makes enough glaze for a 6-8 pound ham. If your ham is bigger than eight pounds, make 1 1/2 or two times the glaze recipe. Once 3/4 of the estimated cooking time has passed, or your ham has reached an internal temperature of 100 degrees F, it’s time to pour on the glaze! My 8-pound ham took 1 1/2 hours to reach this point. Remove the lid from the roaster, open the top of the foil wrapping, and pour 2/3 of the glaze mixture over the ham. Reserve 1/3 of the mixture for later. Re-wrap the ham and put the lid back on the roaster. Once the ham has reached an internal temperature of 120 degrees, use a pastry brush to brush the remaining glaze over the ham. Re-wrap the ham and continue heating at 275 degrees F until the ham reaches an internal temperature of 140 degrees. An optional last step is caramelizing the glaze on the outside of the ham. 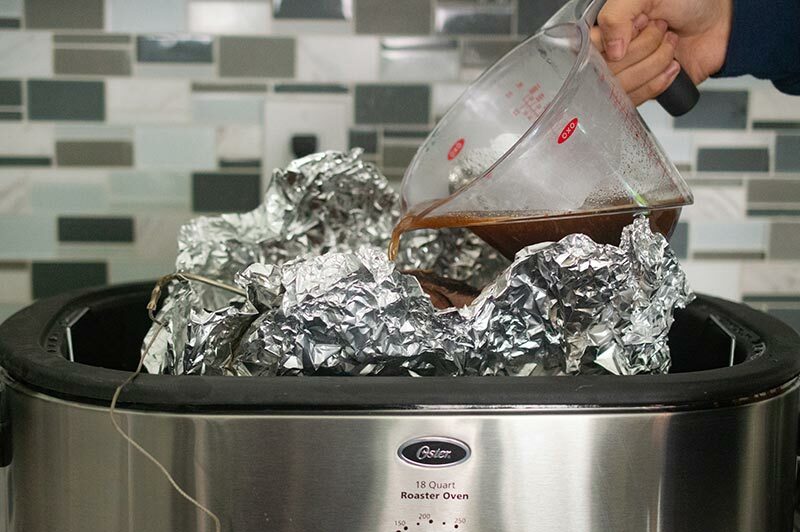 Open the foil and turn up the roaster to 425 degrees. Roast the ham at 425 degrees with the lid on and the foil open for ten minutes. This helps form a caramelized crust on your maple glazed ham, but it will dry the ham out a little bit. I do this because I like a bit of a “crust” on the outside. This maple glazed ham looks impressive when presented on a platter! You can garnish your ham with lettuce, grapes or sliced oranges. Once you’ve taken the ham out of the roaster, there will be some ham juices and glaze left behind in the foil. If you want, you can pour a little of this liquid on the ham for moisture and flavor. I wouldn’t recommend pouring on all the liquid, because that would add too much sugar, salt, and water. 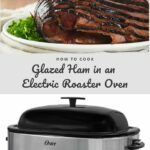 I hope you enjoy making this maple glazed ham in an electric roaster! It’s a beautiful, classic holiday dish, and you don’t have to tell anyone how easy it is! 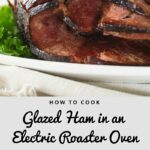 Learn how to make maple glazed ham in an electric roaster oven. 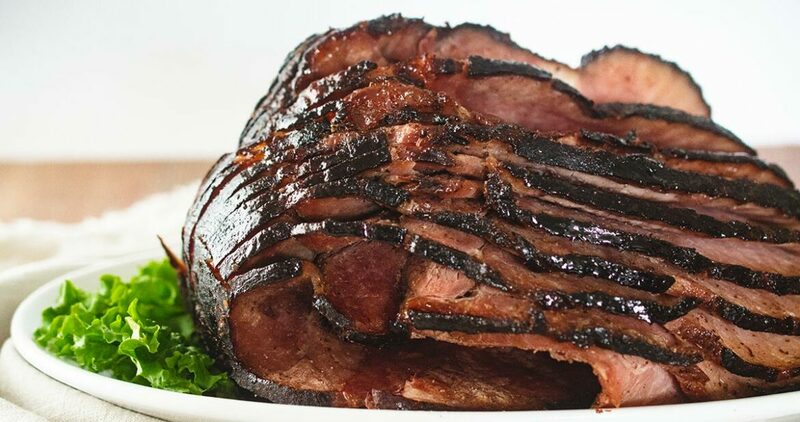 This maple glazed ham recipe is absolutely simple and impressive for special occasions. Pour 2-4 cups water in the electric roaster oven, so the bottom of the roaster is covered to a depth of about 1/4 inch. Place the roasting rack in the bottom of the roaster. Lay 2-3 sheets of heavy duty aluminum foil on a countertop or work surface, overlapping the edges. Use enough foil to cover the entire ham. Remove the ham from its packaging, reserving any juices. Lay the ham on the aluminum foil on its side, with the cut side facing you. Lift the foil and wrap it around the ham, leaving the top open. Place the ham in the roaster on top of the rack. Pour any juices from the packaging over the ham. Insert the food thermometer probe in the middle of the ham, trying not to touch the bone with the probe. Wrap the top of the ham tightly with the foil, but leave the foil loose enough that you can open it later. Secure the lid on the roaster, and turn on the roaster to 275 degrees F. Set the probe thermometer to alert when the ham's internal temperature reaches 140 degrees. Heat the ham to an internal temperature of 100 degrees F (approximately 1 1/2 hours, depending on size). Meanwhile, make the glaze. 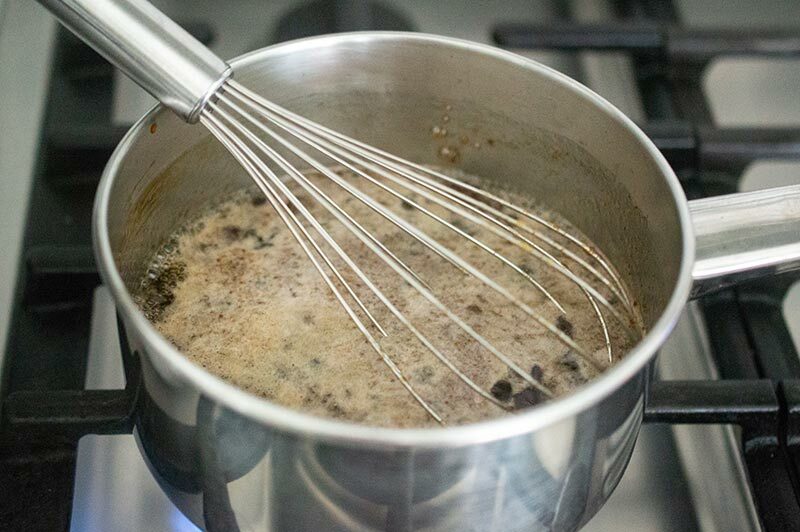 Combine all glaze ingredients in a small saucepan, and bring to a boil over medium high heat. Boil glaze for 2 minutes. When the ham has reached an internal temperature of 100 degrees (approximately 1 1/2 hours), open the foil and pour on 2/3 of the glaze. Re-wrap the ham, and continue heating until it has reached an internal temperature of 120 degrees (approximately 30 minutes). 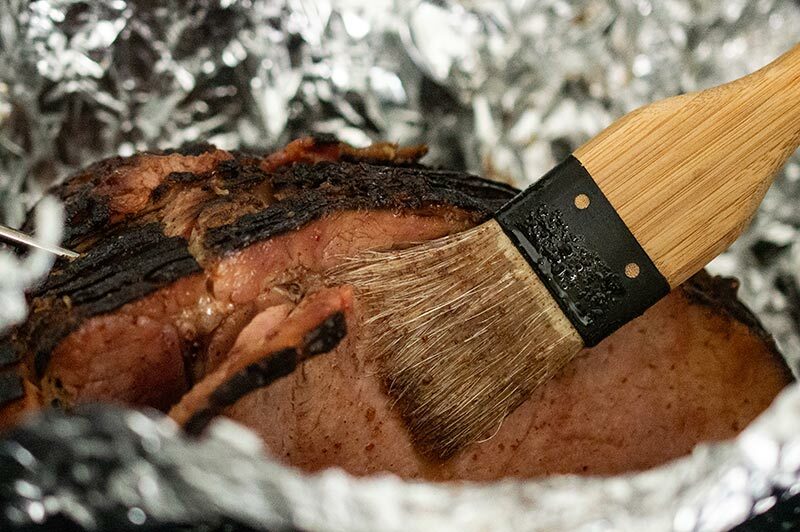 Using a pastry brush, brush the remaining glaze on the outside of the ham. Re-wrap the ham and continue heating until the internal temperature reaches 140 degrees (approximately 20 minutes). Optional: Open the foil and turn the roaster up to 425 degrees F. Bake the ham at 425 degrees for 10 minutes to caramelize the glaze. If your spiral ham comes with a glaze packet, you may add the glaze packet ingredients to your homemade glaze. Cooking times are approximate and will vary depending on the size of your ham. For best results, use a food thermometer. Oh yum! I love this maple-glazed ham and you make it look so easy to follow. I’m adding this to my Easter menu this year. I hope you enjoy it, Linda! It’s my favorite ham recipe now. I love the maple flavor. It’s the perfect balance for ham. Agreed! The maple flavor is subtle but goes perfectly with salty, smoky ham. This ham looks beautiful. So appetizing. I am going to use this recipe for Easter this year. Thanks, Candi – I hope you enjoy it! One of my favorite ways to cook a ham! The maple glaze turns out sooo good!